You may have asked yourself “Can I decorate the outside of my house the same way I do the inside?” And the answer is a definite YES! By following a few simple guidelines, you can create an outdoor area that reflects your style. Consider the area that you will be decorating. Is it in the shade? Is it windy? Is it covered or exposed to the elements? Your answer to this question will be your guide throughout the selection process. Items exposed to the sun need to be fade resistant (including your outdoor fabrics!). Windy areas need pieces that are heavy enough to avoid the occasional gusty wind catastrophe or simply remember to take them inside when not in use. Covered areas give you more flexibility in your decor choices since they are less likely to be impacted by sun, rain or wind. Look for materials that will handle the weather such as aluminum, ceramics, resins and other metals with protective finishes. Tip: Unfinished metals can be treated with a protective clear finish spray found at your area home improvement or hardware store. Think about pieces that can do double duty such as a garden stool which can serve as a table or additional seating. Use plant stands for displaying statuary and other pieces. 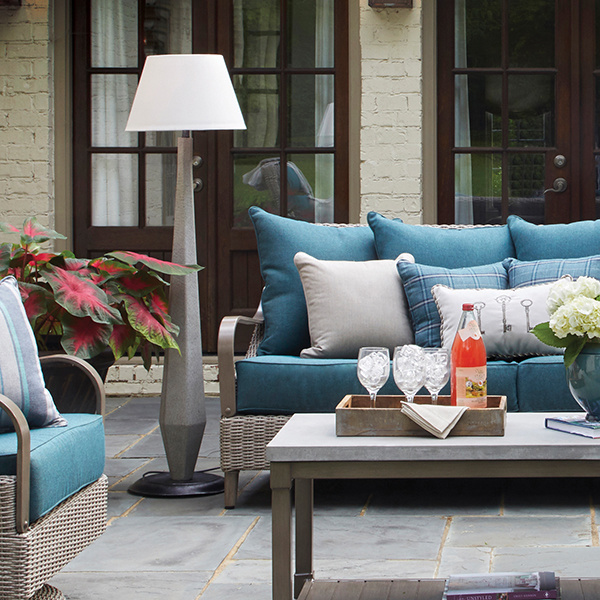 Add pops of color wherever possible to compliment your furniture using outdoor pillows, cushions or rugs. Choose outdoor performance fabrics that won't fade, are easy to clean and will last for more than one season such as Sunbrella. Polyester fabrics will quickly fade and will likely need to be replaced often. Don’t forget the lighting! Add table lamps, lanterns or other accent lighting to set the mood during your evening gatherings. Use an outdoor LED candle for a no muss, no fuss easy way to light up the night. Infuse nature into your space with plants such as begonias, ferns and other lush foliage. Skip the plain terracotta pots and choose a container with a little more flair for your plants. Whimsical colors can be added with fun pieces that can be scattered throughout the yard. Go zen with a soothing water fountain or musical wind chime for those days when you really need to relax. 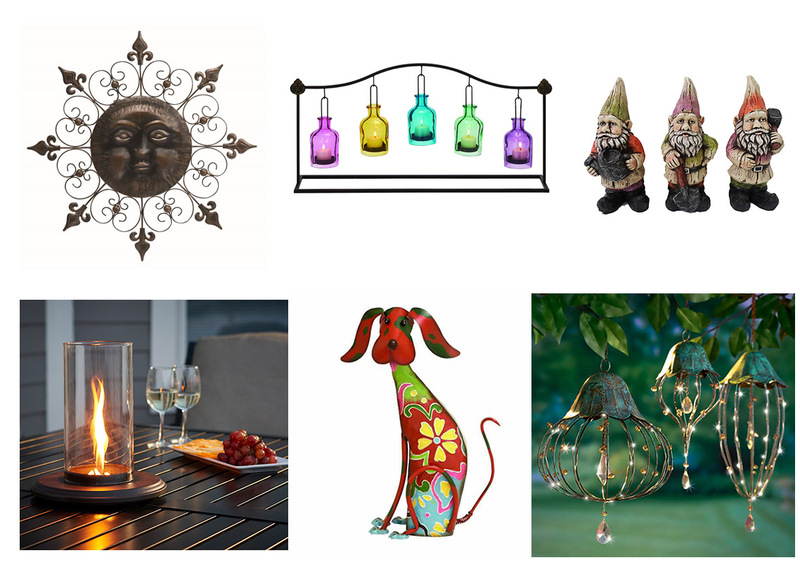 Look for solar lighting decor that brings color during the day and a warm glow in the evening. The possibilities are endless when it comes to outdoor decorating! Let your imagination and personality shine! 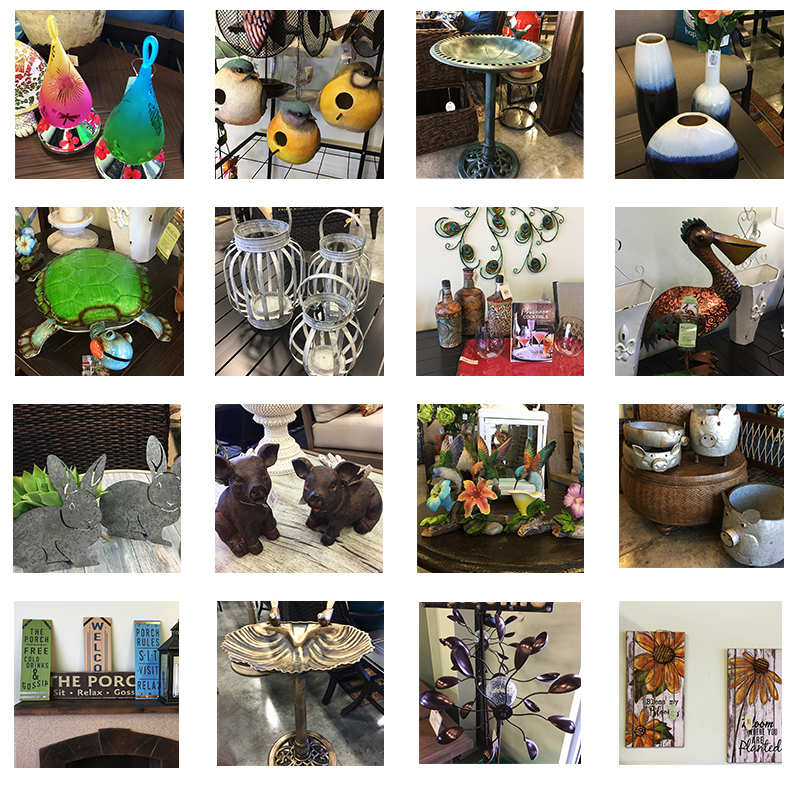 Although we do feature a few of our garden decor pieces online, we have a much larger selection of traditional and unique garden decor, lawn ornaments, outdoor lighting, wind chimes, birdhouses and feeders, colorful yard stakes, statuary, bird baths, beautiful lanterns and much more in our showroom at 3005 W. Cabela's Parkway in Gonzales, next to Cabela's.